We take working in the Mojave Desert as just part of our jobs as many of us chase the employment that we seek to live our lives. The heat, wind and cold is just part of the deal that we put up with to make ends meet while doing jobs that we feel benefit our nation and its security. Edwards Air Force Base has a long and storied history that could not exist without the men and women that, over the decades, spent time looking for a cool spot on a dry lake bed to retreat to. But for some of our early pioneers of the air, the search for shade was much harder to accomplish! Northeast of Edwards is a place named Harper Dry Lake that a few aircraft companies, namely Hughes and Northrop, liked because of its very remote location and lack of the prying eyes of the public. Great for secrecy, terrible for creature comforts! With that said, I want to tell you a story about a project and have you put yourself in the shoes of the hearty folks that spent time at this “other” dry Lake. 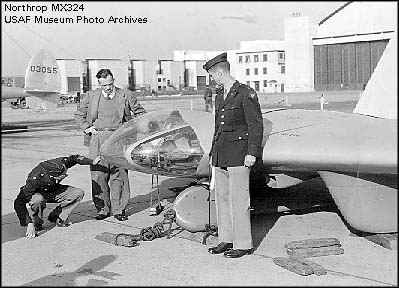 After the N-9M project, Northrop was looking to move on with their flying wing program and thus were born the test aircraft MX-324 Glider and the MX-334 rocket propelled aircraft. 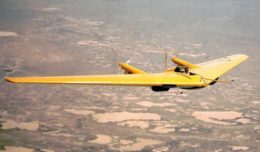 After the N-9M project, Northrop was looking to move on with their flying wing program and thus was born the test aircraft MX-324 Glider and the MX-334 rocket propelled aircraft. 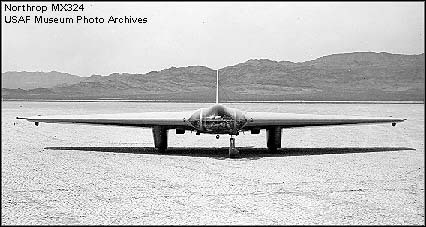 The flying program of the MX-324 glider took place at Muroc but when the time came to move up in performance secrecy was paramount and Harper Dry Lake fit the bill. In 1943 the Germans success with the rocket powered ME-163 Comet set the Allies on a quest for their own entry into rocket flight, and the radical MX-334 looked like the perfect craft to mate the rocket technology to an American airframe. Harper Dry Lake was the best place to test out this new technology. July 5, 1944, in the middle of the Mojave Desert early in the morning you show up for work and are met by the strangest of scenes. First thing; you do not know is that what you’re looking at will be history in the making for the United States, the first flight of an American rocket-propelled aircraft! The second thing; you’re looking at very strange aircraft with a pilot strapped into it with a rocket engine between his legs. A crude chin rest made out of towels and a very scary mix of rocket fuels on both sides of him with safety curtains on his sides in case of a leak! As we go about our tasks we can’t help but think about all that could go wrong! So, if that’s not enough think of the mindset of test Pilot Harry Crosby looking out of his cocoon at a long tow cable hooked up to a P-38 Lightning that was being piloted by Martin Smith. I’m sure when the time came to say “let’s go” it was done with a dry mouth. At 8,000 feet, the word came to cut Harry loose and from a position on a hot lake bed, not an air conditioned flight operations center, the desert nomads of the aircraft industry with some Army Air corps types held their breath. Harry pushed the button that lit the rocket and off he went into the history books and not the desert landscape, it accelerated out beautifully and after the fuel was expended he picked his spot on the lake bed and greased it in! When the ground personnel arrived at the 334 the heat was now up to 100, everybody was covered with sweat and in 1944 the ice we so take for granted today was nowhere in sight in the middle of a dry lake bed, so desert temp water and a few cokes was the beverages of choice to celebrate! Harry had lived an experience few people would ever experience off of Harper Dry Lake. History was made and lessons learned from this experience would go on to benefit many aircraft programs in the future. Some years later, a rocket powered Bell X-1 would push man past the sound barrier and assist other aircraft in jumping to higher speeds but rockets were not the answer and starting with the MX-334 test program a change in priorities and advancements in propulsion the rocket programs slowly started to fade away and the X-15 would be the program most of us would remember when it came to a fixed wing rocket with a man in it. Yes we still have rockets today that are opening new possibilities into space travel with wings and a pilot but one thing I can say is we no longer have the simple process where men stand on a dry lake bed in the middle of the Mojave looking at a plane being towed into the air with more questions than answers and hoping and praying that the slide rules of the day would serve the test pilot in his flight and bring him home safely. Amazing men, amazing times, amazing aircraft we are blessed to live so close to all this history in the Antelope Valley, Now where is that thermostat it’s too hot in here! Till next time, Bob out!